For years it seemed real, resplendent American luxury—the kind with big, cushy, quiet, opulent cruisers—seemed destined to die like the dinosaurs. But the new Cadillac CT6 proves it can be done in a smart, modern, high-tech and fun way. What do you need to know before you buy a CT6? Don’t worry, we’ll tell you everything right here in the Ultimate Buyer’s Guide. The CT6 debuts an all-new platform for Cadillac, as well as the luxury brand’s new number-based naming schemes for cars. It’s bigger and less sporting than a CTS, but offers a range of engines that could hardly be considered lethargic. Add an aluminum architecture for a surprisingly low curb weight and segment-exclusive tech and features, and you have a very solid offering from Cadillac that takes the concept of their old cruisers and updates them for a new century. Smooth. Quiet. Powerful. Comfortable. All the things you expect a Cadillac to be, except this one is pretty light. And with modern engines, available Magnetic Ride Control and rear-wheel steering, it’s a surprisingly good driver’s car. The cabin reveals a massive overhaul from previous Cadillac sedans, with a wide touchscreen, a very premium optional audio system, and a mouse-like controller that didn’t work as well as we had hoped. Fit and finish, however, is impeccable, making this Caddy more of a German competitor than ever. Engines range from a humble but thrashy four-cylinder to a twin-turbo V6 with more than adequate passing power. A twin-turbo V8 is also in the cards on future models, as is General Motors’ first-ever semi-autonomous driving system, Super Cruise. The Cadillac CT6, debuted at the New York Auto Show, is an all-new model for 2016, and is Cadillac’s first rear-wheel drive full-size luxury sedan in 20 years. That’s a shame, because that used to be their bread-and-butter. Instead, their full-size sedan has been the front-drive XTS, which is basically reworked Impala with a nice interior. But for ‘16, Cadillac showed the world a quiet, comfortable sedan offered with advanced powertrain options like a 265hp 2.0-liter turbo four, 335hp 3.6-liter V6 or a 400hp 3.0-liter twin-turbo V6. It’s supposedly the beginning of a new era for Cadillac, one in which Cadillac seems to be playing more to their own strengths rather than trying to be like the Germans. 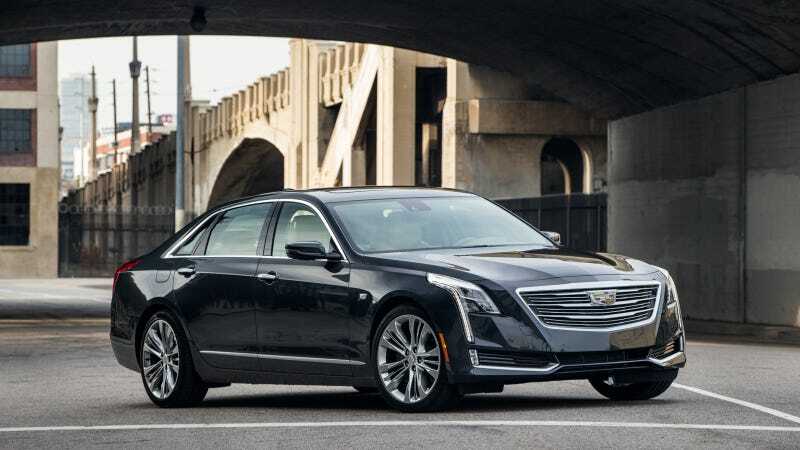 The Cadillac CT6 comes with three engine choices: a 2.0-liter turbo four making 265 horsepower, a 3.6-liter naturally aspirated V6 cranking out 335 horses or a 404 horsepower 3.0-liter twin-turbo V6. All engines are pressed up against eight-speed automatic transmissions, though the 2.0 and 3.6 get GM’s Hydra-Matic 8L45 while the powerful 3.0-liter gets a beefier 8L90. The four-banger is the only CT6 that gets rear-wheel drive, as both the V6s send their torque to all four wheels. Fuel economy may not be the primary reason someone buys a large luxury sedan, but the CT6 isn’t a heavy drinker. Though nor is it overly-frugal. It’s about what you’d expect for a modern sedan with turbocharged engines and lots of gears in the transmission. The four-pot gets 31 MPGs and 25 combined, the N.A. V6 gets 28 on the fast roads and 22 in mixed conditions, and the powerful engine brings up the rear with 26 MPG highway and 21 combined. The Cadillac CT6 comes in four trims: base, Luxury, Premium Luxury or Platinum. The base CT6 gets either a 2.0-liter turbo or a 3.6-liter V6, the Luxury trim can be had with either of those engines or a 3.0-liter twin-turbo, and Premium Luxury and Platinum trims offers only the two V6s. The V6s come with standard all-wheel drive, while the 2.0-liter gets only rear-wheel drive. Steering for all trims is electric and suspension is an independent five-link design in the rear and a multi-link independent front design with coil-over twin-tube shocks on all corners. Magnetic Ride Control (adaptive damping) and rear-wheel steering are available on some trims. Brakes are four piston calipers up front squeezing 13.6-inch rotors on V6 models and 12.6-inch discs on 2.0-liter turbo models. In the back, there are single piston calipers grabbing 12.4-inch plates. CT6 3.6L: Starts at $56,490. Notable standard features over CT6 2.0L: 3.6-liter V6, all-wheel drive, 19-inch alloy wheels, 245/45R19 all-season tires. Notable options: Ground Effects Package: front splitter, rear diffuser, black rocker panels ($2,109); Driver Awareness and Convenience Package ($2,950). Luxury 2.0L: Starts at $59,390. Notable standard features over base CT6 2.0L: Bose 10-speaker surround sound audio system, Driver Awareness and Convenience Package, automatic park assist, heavy duty brakes, Automatic Vehicle Hold Braking, cornering lamps, Concierge lighting, heated power-folding mirrors, rain sensing wipers, illuminated door handles, hands-free decklid, 16-way power heated front seats, memory passenger seat, heated steering wheel, Vehicle interior movement sensor, vehicle inclination sensor, rear manual sunshades, navigation, Surround Vision. Notable options: Enhanced Vision and Comfort Package: rear HD camera mirror, UltraView panoramic power sunroof, vented front seats, heated outboard rear seats ($2,025); Rear Seat Package: 3.3-inches of adjustable seat travel with lumbar adjustment, tilting cushions, massage feature and heated/cooling features, armrest with media controls, dual 10" rear displays, remote control, two wireless headphones ($2,450+Enhanced Vision Package); Bose Panaray 34-speaker sound system ($3,700). Luxury 3.6L: Starts at $61,390. Notable standard features over Luxury 2.0L: 3.6-liter V6, all-wheel drive, 19-inch alloy wheels, 245/45R19 all-season tires. Notable options: Active Chassis Package: Magnetic Ride Control, Active rear steering, 20" alloy wheels ($3,300); Enhanced Vision and Comfort Package ($2,025); Rear Seat Package ($2,450+Enhanced Vision and Comfort Package); Ground Effects Package ($2,190); Bose Panaray 34-speaker audio system ($3,700). Premium Luxury 3.6L: Starts at $64,565. Notable standard features over Luxury 3.6L: Vision and Comfort Package, 12-inch gauge cluster display, head-up display. Notable options: Comfort Package: unique leather seats with vented front seat cushions and seatbacks ($900); Driver Assist Package: Adaptive Cruise Control, Enhanced Night Vision, Front and rear automatic braking ($4,380); Rear Seat Package ($2,450); Active Chassis Package ($3,300); Ground Effects Package ($2,190); Panaray 34-speaker audio system ($3,700). Luxury 3.0L: Starts at $65,390. Notable standard features over Luxury 3.6L: 3.0-liter turbo V6. Similar options to Luxury 3.6L. Premium Luxury 3.0L: Starts at $68,565. Notable standard features over Luxury 3.6L: 3.0-liter turbo V6. Similar options to Luxury 3.6L. Platinum 3.6L: Starts at $84,460. Notable standard features over Premium Luxury 3.6L: Driver Assist Package, Rear Seat Package, Active Chassis Package, Comfort Package, Bose Panaray 34-speaker Surround Sound audio system, quad-Zone automatic climate control, 20-way driver and passenger seating with four-way lumbar and four-way head restraints, five massage programs for seats, 20-inch unique wheels, power articulating vented rear bench, ionizing air cleaner. Notable options: Ground Effects Package ($2,190). Platinum 3.0L: Starts at $88,460. Notable standard features over Platinum 3.6L: 3.0-liter turbo V6. Similar options to Platinum 3.6L. Go big or go home. In our all-too-brief first drive, we found the CT6 is best with options. The twin-turbo V6 is the engine to get here, and coupled with the four-wheel steering and all-wheel drive, it’s a shockingly nimble luxury sedan—albeit one that stops short of being a true sport sedan. The base four-cylinder engine is merely adequate, but too harsh to be worthy of a real luxury car. The NA V6 will likely be fine for most, but the turbos are where it’s at. Is the Bose Panaray 34-speaker sound system worth the extra $3,700? We say yes if you’re an audiophile. It has speakers in the seats! What more do you want?